Purple Overdose - "Painting The Air"
Based in Greece, Purple Overdose were one of the great psychedelic bands of the past several years. Though disbanded for a couple years now, their manager, Stefanos Panagiotakis, enthusiastically pursued making available this vinyl only collection of rarities and unreleased tracks. The songs on Painting The Air were originally recorded in 1989 with the intention of comprising their second album, slated to be titled Magic Forest. Five of the songs later ended up, in different forms, on what ultimately became their second album, Indigo. Long time Purple Overdose fans will be pleased to know that two of the tracks are unreleased. 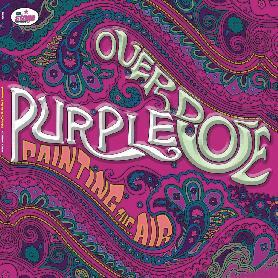 "Painting The Air" is classic Purple Overdose 60's inspired psychedelia, a heady mixture of trippy song and acidic instrumental. And "Still Ill" is a special treat, being one of the first ever recorded Purple Overdose songs, and featuring a guitar/bass/drums trio version of the band. It has the trademark Purple Overdose sound, but has more of a down ‘n dirty garage-psych feel, and includes an ultra trippy jam section. Excellent! "Sail On Your Wings" originally appeared on the volume 3 CD of the fanzine The Thing in 1996, and was later included on the CD version of The Salmon's Trip Live. This track is a real highlight, featuring Purple Overdose at their most cosmic, with swirling guitars, a luscious 60's organ sound and a mind expanding atmospheric vibe. "2008 Old View" is the B side of the bands only 7" single, and is an intense song with more classic 60's organ melody and cool shimmering trip guitars. Those who own the album Indigo will of course recognize the 5 songs that appeared on that album - "Moonlight Sunshine", "Cosmic Ladder", "Rain Without Storm", "Golden Eyes" and "Magic Forest". Diehard fans with a taste for historical perspective will enjoy hearing these earlier versions of the songs. Most have a rawer sound and feel than the Indigo versions, which in some cases has a special charm of its own, having a cool trippy flower power vibe. I particularly liked the version of "Cosmic Ladder" on this collection, which has much more of a garagey sound than what's heard on Indigo, and we get some really tasty screaming guitar lines. And though similar to one other, the versions of "Golden Eyes" and "Magic Forest" are each lengthy tracks that take off into jams that are worth hearing side by side. In summary, Painting The Air is a real treat for fans of this sadly defunct band. And as most of their albums were vinyl only releases that are long out of print there are likely many of you out there who have never had the opportunity to hear any of these songs. Here's your chance. For more information you can visit the On Stage Records web site at: http://www.geocities.com/onstagerecords. Email Purple Overdose at: purpleoverdose@hotmail.com.